Aim and Objective: Some ferrocenyl derivatives are active in vitro and in vivo against cancer. Generally, ferrocenyl derivatives for cancer research have three key components: a ferrocene moiety, a conjugated linker that lowers the oxidation potential and some derivative (peptide, nucleobase and others) that can interact with biomolecules. Since the pyrimidine fragment can easily pass through the membrane into the cells and become involved in metabolism; it appears to be promising. Furthermore, this fragment is an electron-acceptor group, so a spacer can be excluded. Therefore, the synthesis of 6-ferrocenylpyrimidin-4(3H)-one derivatives and the study of their anticancer activity have scientific and practical interest. 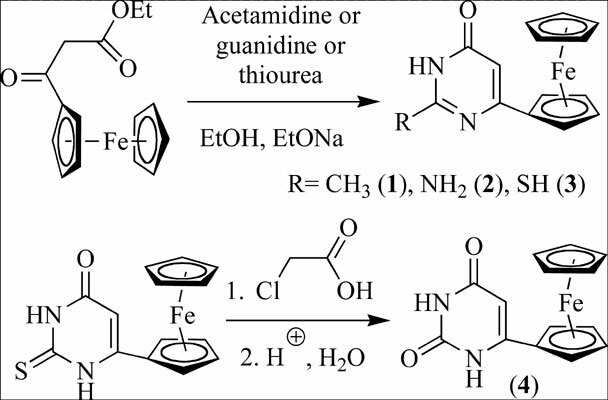 Methods: The syntheses of 6-ferrocenylpyrimidin-4(3H)-one derivatives were performed by the condensation of ethyl 3-ferrocenyl-3-oxopropionate with thiourea or acetamidine or guanidine. The cytotoxicity of four 6- ferrocenylpyrimidin-4(3H)-one derivatives was evaluated by using the MTT assay in vitro against Human breast adenocarcinoma MCF-7 and normal human skin fibroblast HSF cells. The tested derivatives induced a concentration-dependent cytotoxic response in cell lines. Results: A study of the cytotoxic activity of 6-ferrocenylpyrimidin-4(3H)-one derivatives by the MTT test has found that all compounds have a dose-dependent toxic effect on the lines of breast cancer cells (MCF-7) and normal human fibroblast cells (HSF). The most pronounced cytotoxic effect is exhibited by 2-methyl-6-ferrocenylpyrimidin- 4(3H)-one (MCF-7, IC50 17 ± 1 µM). Conclusion: The experimental results confirm the importance of investigation and design of ferrocenylpyrimidin- 4(3H)-one derivatives as anticancer agents. Compounds where the pyrimidine derivatives are directly linked to the ferrocene unit rather than via a spacer group also may be of interest for antiproliferative drug design. Ferrocene derivatives, pyrimidine, cytotoxicity, synthesis, DFT, anticancer agents.